The series opener will appear on Comcast SportsNet Chicago locally and TNT nationally. Game 2 will be played on Tuesday at the United Center and start at 8:30 p.m. CT with CSN and TNT again handling the broadcast. The series will then shift to Washington for Games 3 and 4 on Friday, April 25 and Sunday, April 27. All games will air on ESPN 1000 AM. In addition, all home games will air in Spanish on WRTO 1200 AM. 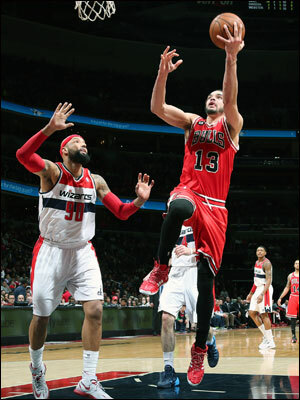 Joakim Noah and the Bulls closed out the 2013-14 campaign at 48-34, but it was down the stretch in which the team was it its best. In three regular season games against Washington, Chicago went 1-2, falling twice within four days in January but winning their last meeting 96-78 on April 5. Bulls coach Tom Thibodeau shared a few thoughts about what will make the Wizards a tough matchup following Chicago’s 91-86 overtime loss in Charlotte on Wednesday. The Bulls closed out the 2013-14 campaign at 48-34, but it was down the stretch in which the team was it its best. Since Jan. 1, Chicago won an Eastern Conference-best 36 games and owned the best record in the East with a mark of 36-16. Tickets for the first two rounds of the 2014 NBA Playoffs (eight possible home games) are on sale now through Bulls.com, NBATickets.com, the United Center and 1‑800‑4NBA‑TIX.